Don't hate the playa, hate the game! Okay, I find this really ridiculous! “What?” you might ask… and I’m so glad you did. The fact that Disney’s The Lion King 3-D made $30.2 million in theaters this weekend. I think it may be just me because I don’t have a job (like many other Americans out there) to go see a movie that I ALREADY OWN on vhs and dvd. I love The Lion King, but why would I spend extra money on a movie I’ve seen thousands of times, in the comfort of my home at that? Just because it’s 3-D?! I think not. I’m sorry, but 3-D hasn’t made me a believer yet. I don’t like it! It’s too much on my eyes with all the images. I’m leery of those glasses I have to wear as far as germs are concerned. Lastly, I don’t want anything all up in my face or flying toward it, even if it is fake. I almost forgot, it’s too damn expensive!! Most people who probably went to go see this are families- that had to have cost them a pretty penny for a family of four or more. I’m not trying to knock Disney’s hustle (or anyone else for that matter), but this is straight up capitalism at its finest. They took a movie already made and many years old (16 to be exact) and just made it 3-D. This did very little to add jobs in this economy, but made millions of dollars off of the American people. With all that is going on in our economy I would much rather spend the extra money to see the live production over and over at a theater. At least, I know that many significant hands are needed for the overall production (i.e. actors, production staff, ushers, etc). There are talented people able to work because of a play. A spectrum of employees from minimum wage to college graduates. May I add that the play is culturally more sophisticated than a movie, especially this day and age. Maybe if our economy was in better shape and our unemployment rate was lower I wouldn’t be so annoyed about The Lion King 3-D. The fact of the matter is that there is a bigger picture here that apparently people are missing. 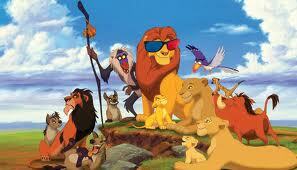 I love Disney and The Lion King very much. I saw the movie in the theater as a child and watched it day in and day out once it was on vhs (man I feel old talking about vhs), but at the end of the day I think that its a waste of time and money to see it 3-D. Even if you have children who are under six years old. I’m sure the Disney vault will open again and allow you to purchase the movie on dvd for your children. Nonetheless, the book is available for you to read your children the wonderful story of Simba and his journey. What are your thoughts on the release of The Lion King 3-D? Speak your mind. Very good points! smh. Not getting my monies… no ma’am!